It’s the way I was taught, it’s the way you were probably taught, and it’s the way we’re probably teaching our kids. And we are all wrong. If you ever wondered what the right way is to navigate roundabouts in Australia, how to navigate a multi-lane roundabout, or even who has the right of way when merging, we can almost guarantee that the majority of drivers are giving way to traffic on their right, and this, without exception, can earn you a ticket in every state and territory in Australia. A roundabout is, of course, a traffic device that was originally designed to replace intersections. They also work to reduce the instances of head-on collision, and are designed to keep traffic flowing through junctions and intersections. However, there is a widely held misconception that, upon approaching a roundabout, a driver is only required to give way to traffic on their right that is already in the roundabout. This is incorrect. 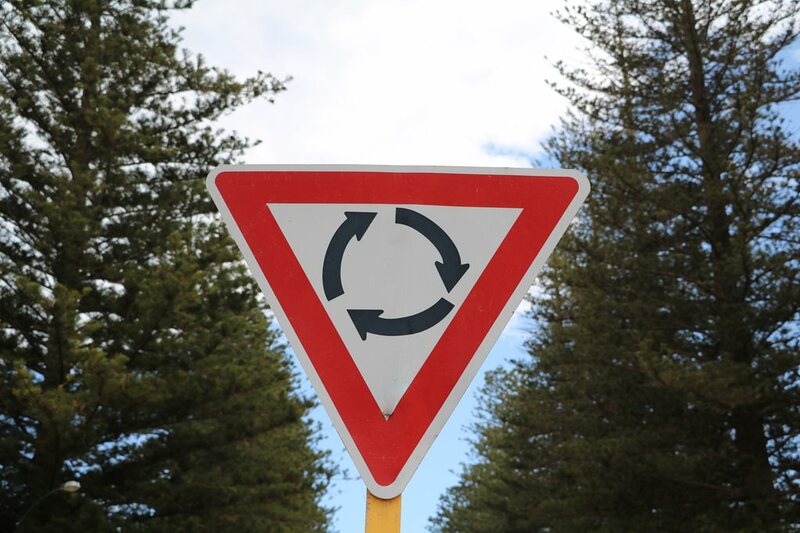 Roundabout rules in Victoria and NSW, as well as all other states and territories, expressly state that a driver is required to give way to ALL traffic in a roundabout. When entering a roundabout, a driver must give way to any vehicle, including bikes, in the roundabout, as well as any tram or light rail vehicle entering or approaching the roundabout. In many cases, this does mean giving way to vehicles approaching from the right. However, a vehicle may have entered the roundabout ahead of the driver from the left, and the driver will have to give way to this other vehicle to avoid a collision. Fail to give way to a vehicle in the roundabout, and you could be up for a nasty fine. ACT roundabout rules are the most stringent, with a $451 fine and three demerit points docked from offending drivers. The same offence carries a $330 fine in NSW and a $378 sting in Queensland. It’s a relatively affordable $159 in Victoria and Tasmania, and ‘just’ $150 for breaking roundabout rules in WA. We’ve also been asking whether you can change lanes in a roundabout. The answer to this comes down to the same thing as changing lanes and overtaking: the line markings. A multi-lane roundabout will usually have direction arrows painted on the road surface ahead of each junction point, and these serve as the first point of reference. For example, the left lane of a two-lane roundabout will often feature a left-turn arrow incorporated into a straight-on arrow. This means you have a choice of taking a left exit or proceeding ‘straight’ through the roundabout. If the roundabout is marked with solid lines throughout, you’re locked into your lane choice. When it comes to indicating when exiting a roundabout, that boils down to courtesy and common sense. Just like exiting any road, drivers have to signal left when leaving a roundabout if it’s practical to do so and turn off the indicator as soon as they have exited the roundabout. When travelling straight ahead on a small single-lane roundabout, it may be impractical to indicate left when exiting. However, on larger, busier roundabouts, it can help traffic flow if you can briefly indicate your intentions to drivers waiting to enter the roundabout. It’s not a rule, however, and behaviour varies from state to state.